Un-Reconstructed Racism? | Un-Reconstructed Racism? – The Republic of T.
My penchant for procrastination (more on that later) frequently bleeds into my blogging. I’ll bookmark something I plan to blog about, and keep putting it off until I’ve gathered enough information or figured out what I want to say. By then, it’s usually not news. Fortunately, everything has a way of coming around again. So I have Virginia Delegate Frank Hargove to thank for this opportunity to get back to what I intended to post, via his remark that blacks should “get over” slavery. A state legislator said black people “should get over” slavery and questioned whether Jews should apologize “for killing Christ,” drawing denunciations Tuesday from stunned colleagues. Del. Frank D. Hargrove, 79, made his remarks in opposition to a measure that would apologize on the state’s behalf to the descendants of slaves. Hargrove’s remarks reminded me of a similar statement that caused a furor not long ago. First, though, it’s worth noting that Hargrove’s statement came around the same time that — as Prometheus points out — some conservatives recently argued that the Dred Scott case was rightly decided. In case you need a refresher on what you learned in your history class, here’s the basic story of Dred Scott, and here’s how the Supreme Court ruled in his case. In March of 1857, the United States Supreme Court, led by Chief Justice Roger B. Taney, declared that all blacks — slaves as well as free — were not and could never become citizens of the United States. The court also declared the 1820 Missouri Compromise unconstitutional, thus permiting slavery in all of the country’s territories. The case before the court was that of Dred Scott v. Sanford. Dred Scott, a slave who had lived in the free state of Illinois and the free territory of Wisconsin before moving back to the slave state of Missouri, had appealed to the Supreme Court in hopes of being granted his freedom. Back in October, Ex-Gay Watch did an excellent job of tracking a justification of slavery that was posted to the website of the National Association for and Therapy of Homosexuality (NARTH), which (before it was yanked from the site) included this stirring defense. The Los Angeles Times eventually covered the story, and even the Southern Poverty Law Center weighed in with this statement. NARTH is a coalition of psychologists who believe it’s possible to “cure” homosexuality, a position rejected by the American Psychological Association and the American Medical Association. The controversy over Schoenewolf’s apology for slavery has battered the so-called “ex-gay” movement with accusations of racial bigotry for the first time. The movement’s leaders and their close allies at Christian Right powerhouses like Focus on the Family have failed to condemn Schoenwolf’s inflammatory arguments. It seems par for the course. After all, Virginia Republicans are defending Hargrove’s statements, not condemning them. Trent Lott has long standing ties with “neo-confederates,” was been quoted in Southern Partisan as saying he’d vote to eliminate the MLK holiday, and lamented Strom Thurmond’s loss as the “Dixiecrat” candidate for the oval office, but has returned to leadership as Senate Minority Leader. In the documentary Red State a Concerned Women for America (speaking of “Christian Right Powerhouses”) spokeswoman calls for the repeal of civil rights. In 2005, Senate Republicans balked at apologizing for lynching; or, more specifically, the Senate’s failure to pass anti-lynching legislation back when it was all the rage. And in Texas, conservatives have denounced history textbooks for being “overly negative” about slavery. Schoenwolf’s statment sounds vaguely related to the rantings of Michael Marcavage. The crux of Marcavage’s worldview is biblical literalism. Even those famous instances where the Bible seems to wander from modern conceptions of right and wrong, Marcavage explains away as misinterpretations. Biblical slavery, for instance, is “not in the sense of based on the color of someone’s skin, but about how people were admitted into voluntary slavery based on them wanting to be in service to others.” Nor is Marcavage bothered by the suggestion that, in adhering to his own interpretation of the Bible, he is ultimately putting his faith in the superiority of his own intellect. He says that on some matters, the Bible is just clear. Marcavage heads up Repent America (note the website has separate entrances for Christians and non-Christians), which finds George W. Bush to be too liberal. 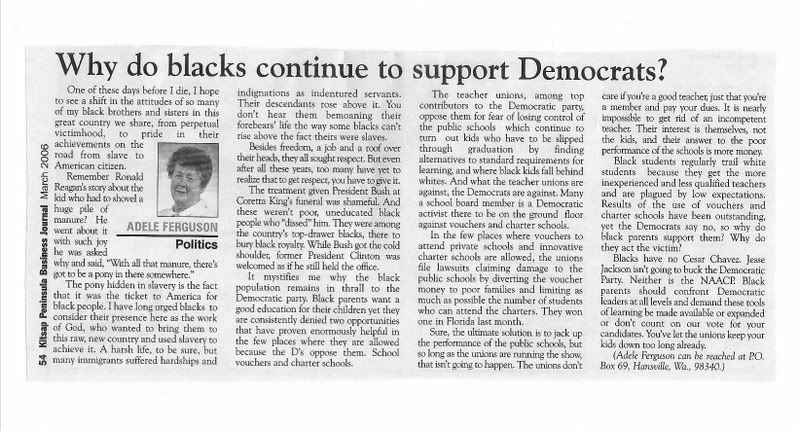 Then there’s Adele Ferguson, who had this to say in her column for the Kitsap Peninsula Business Journal. The pony hidden in slavery is the fact that it was the ticket to America for black people. I have long urged blacks to consider their presence here as the work of God, who wanted to bring them to this raw, new country and used slavery to achieve it. But let me get back to the question concerning how few “Christian Right Powerhouses” have spoken out against various statements like Hargrove’s, or any other Republicans’ for that matter, regarding slavery, civil rights, etc. Why? Why haven’t they spoken out against concepts that, the overwhelming majority of self-identified Christians in America would probably find morally offensive and indefensible, like slavery or segregation? They can’t. It’s inherent in the particular brand of Christianity that groups like Concerned Women for America (run by Berverly LaHaye, wife of apocalyptic author Tim LaHaye) and Focus on the Family subscribe to more or less openly, and that’s detailed in books like Kingdom Coming: The Rise of Christian Nationalism and a few others I’ve read. Call it Dominionism or Christian Reconstructionism, the basic idea is that the country should be run according to their literal interpretation of the Bible. And the granddaddy of that movement had some interesting things to say about slavery too. They, the “Christian Right Powerhouses,” can’t denounce statements like Hargrove’s or anyone else’s precisely because either those statements aren’t that far from what they privately believe, or because to denounce them would mean having to renounce the statements of a founder of their movement. Or they’d have to do some serious contortions to reinterpret them, and these folks are all about literalism. So, they’re “un-reconstructed” reconstructionists, in a sense. And, as they comprise about 30% to 40% of the Republicans’ base, they’ve got the party by the balls as well. Few if any Republicans will go so far as to denounce Hargove or anyone else who makes such statements. So, Hargrove gets a spirited defense, Lott returns to leadership, and no one asks or bothers to point out what they really believe. They’re just misunderstood. Because, as I’ve pointed out before, religion is the great conversation stopper, and criticizing even faith-based bigotry is too much to contemplate. So, they get a pass. And, maybe, we get “reconstructed.” Eventually. several of these quotes were some of the most degenerate, racist, ignorant and disgusting that I have read in some time. Why anyone, especially people of color and women, would want to align themselves with these degenerates is beyond my comprehending capabilities. It is sad that people can say these things and honestly believe that the are being reasonable and that what they are saying is true. slavery is good for only one thing: subjugating a group of people and FORCING them to work w/out benefit of monetary or societal compensation. did any of these ‘people’ ever stop and wonder why slaves were not allowed to read? Whites knew that their doing so, would cause discontent and unrest amongst slaves- and it did. But, I do not believe in or adhere to religions. Religions have caused more hell and viciousness as practiced by so-called humans for as long as humnas have walked the Earth. Be prepared to be slapped in the face. Immediately, I wondered why you decided to give these ignorant people the time of day on your blog, and then I remembere that it is these same ignorant racist, patriarchal, white supremecist, dead scripture (said by their own Jesus) quoting, literalist idiots that have control of the world by and large and have considerable sway in politics (or so they think). So it becomes necessary to know our enemy and their sociopathic reasoning and justification for polarity and subjugation of others, it’s that old axe about humans always wanting to be special or better than someone else, how pre-school and yet pathetic.